Who will be crowned Miss Earth 2017 winner? Please scroll down for my live blog updates! Let's all find out who she is as the pageant finale takes place to night, 8PM, at the Mall of Asia Arena, Pasay City, Philippines. 85 candidates are vying for the Miss Earth 2017 title (previously 86, Miss Earth Haiti reportedly withdrew just a few days ago due to chicken pox). Hosting the coronation night is James Deakin, while the guest performers are Iskandar Widjaja and Shontelle. We shall see how accurate my predictions are this year. I really do wish the new Miss Earth 2017 winner will come from a country who has never won previously in this pageant. Hopefully, it's Miss Thailand Paweensuda 'Fahsai' Drouin. 8:00PM - The pageant starts with the 85 delegates make their introduction in their superhero costumes. 8:22PM - Announcement of awardees for each of the Preliminary Rounds. First to be announced was the Top 16 for "Figure and Form". Just 15 were called. The host probably missed reading one. 8:23PM - 'Beauty and Face and Poise' Top 16 awardees have been named. 8:24PM - The Top 16 for 'Intelligence and Environmental Awareness' have been revealed. Only Australia, Netherlands, Thailand and Switzerland were able to make it to the Top 16 of all 3 preliminary events. 8:35PM - Introduction of Miss Earth 2017 judges. I correctly guessed 11 of the 16 semi-finalists. It's a huge surprise that Miss Puerto Rico, one of my Top 4, did not make it. 9:06PM - Shontelle performs her song 'Impossible'. I predicted 5 of the Top 8. Two of the Top 8 are Pinay, as Miss Australia is half-Filipino. Sadly, USA and Vietnam who ranked 6th and 8th on my list are now out of the game. 9:39PM - After going through the Q and A round, where each of the Top 8 talked on a particular trending topic, 4 girls remain to continue their quest for the crown. It's a surprising Top 4 for me, since two major favorites Thailand and Venezuela have already been eliminated. 9:48PM - Miss Earth 2017 Final Q&A Portion. Just one question for the Top 4: "Who or What is the biggest enemy of Mother Earth?" 10:00PM - Time to crown the winners! It takes quite some time until it fully sinks in. Never in my wildest dreams have I ever thought I would represent the Philippines and win an international title in a prestigious pageant that upholds a relevant cause. I am honored and privileged to be the very first scientist to join and win in the whole history of Miss Earth as I shared my voice and represented the whole scientific community for the world to see and hear. I am confident enough to say that it was not by my own abilities that made me standout in performing during the coronation night in all segments especially in the question and answer portion, it was by the Spirit of God that led me through. Apart from Him I could not have done it. He was the One who gave me confidence and wisdom in presenting myself as a whole package in front of the whole world. It’s never easy to win the crown in your own country because you have to make double even triple efforts to show to everyone that you’re fighting the battle at your best just like everybody else but what made my journey extra special was the overwhelming support I got from my fellow Filipinos. If there’s one thing I am proud about my people despite of being known to be hospitable, it’s our camaraderie. We show to the whole world what bayanihan is all about when the spirit of communal unity and cooperation is displayed for all to see. No amount of words will change the fact that the battle has already been won. I don’t take this crown for myself, It is for the whole Philippines. This battle was not mine alone but ours. I am proud in raising our flag for the whole world to witness. I would like to thank EVERYONE for the love, prayers and support you have given me in my unforgettable journey here in Miss Earth. This once in a lifetime experience will truly be remembered and treasured forever. I am more than ready to continue the legacy of beauty and responsibility. May this be a beacon of hope for everyone to see that our micro efforts will have macro effect as we take this challenge together as a global community with a collective action. This is Karen Ibasco, your Miss Earth 2017!👑🇵🇭🌎 ALL GLORY TO GOD! 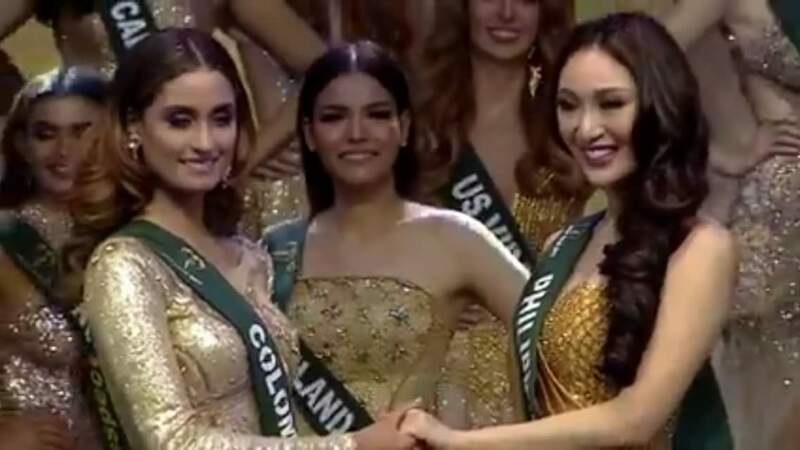 It's now the 4th Miss Earth crown for the Philippines, the most by any country. PH already won in 2008 (Karla Paula Henry), 2014 (Jamie Herrell) and 2015 (Angelia Ong). Rachel Peters on Miss U loss: "I gave my all..."